Last week, I had the privilege of being the very first guest blogger for Mad Housewife Wines. I wrote about Christmas traditions around the world. You can check it out here. You can find Mad Housewife on Facebook and also on Twitter. 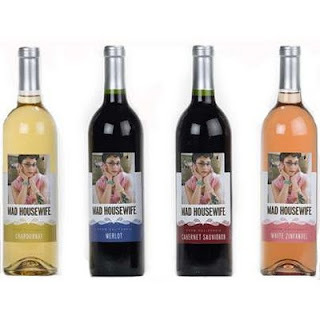 This week, I will be giving away a bottle of Mad Housewife and a Mad Housewife t-shirt to two lucky readers. To enter, leave a topic related comment before midnight on December 24. 1. Your comment must pertain to the post I wrote or to Mad Housewife. General comments will not be accepted. 2. You have to be a blog follower. All you have to do is click the follow button on your right. Winners will be chosen at random. Contest ends at 11:59 December 24. Winners will be announced December 27, 2010. WINNERS- YELLOW TENNESEE AND DARQUE THOUGHTS. Please send me your mailing address, shirt size (L or XL) and prefered wine to drnknhousewife@gmail.com. I still think my tree nativity scene would not be complete without an Obama pooper. While I'm thankful that I don't live in Austria, I'm pretty ready for Christmas to be over. Seriously, in parts of Asia, Kentucky Fried Chicken as Christmas Dinner, now that would go great with some Mad Housewife!!!! I think I would be scared of Krampus myself! At my house the tradition is this: the kids misbehave even though I threaten them with coal (the 9 year old is obstinate and says she WANTS coal), somehow work gets busier than ever and I have less time when I really need more, my house is in a perpetual mess as the tree needles shed and wrapping supplies spread out and I console myself with a glass of wine. I think I shall have to invest in "Mad Housewife Wine" since I am clearly a poster child. I'm starting a new Christmas tradition this year - Mad Housewife wine and watching the Christmas Story over and over and over.. When my dad was stationed in Germany, on Dec 6th I believe we left our shoes outside our front door and St Nick would fill them with candy and chocolate. I wish we had kept that tradition. I am going to start my own Christmas tradition...I am going to drink Mad Housewife wine and scare the demons away myself...for those of you who know me...after a few glasses of wine that is very possible. Is this where I enter for the wine give-away? If so, I wanna win it. And I wanna drink it. are you going to announce the winners of the wine??? Looks like I missed it! I'm curious: What "kind" of wine is your favorite? i usually drink pinot grigio, if i'm in the mood for white and cabernet if i'm in the mood for red. i usually don't drink cabernet, though, because i seem to forget how much i like it until i have a glass in front of me!